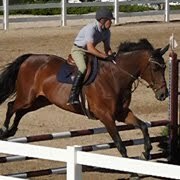 Beyond the services of equestrian horse boarding and training, we offer full-care service. We do focus on individualized care and since we are a small barn, we're able to accommodate most requests. If you wish to have daily turn-outs, blanketing, long-lining, out-of-town travel care, special medication or feed... naming a few of the services available. 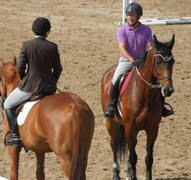 Some of the services have small monthly or one-time fees to tailor to your horse's needs. When you are ready, we are ready to support your show competition goals at USEF A-Rated events. Our barn averages 7 to 9 weeks of showing primarily through the spring and summer months. Our hay is supplied by our own farmer in Strasburg, CO. It's quality is quite high and consistent. The farrier, S&S Horseshoeing, started working at our barn when he was 12-years-old. 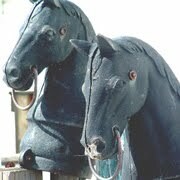 He now provides our on-site farrier services with quality work for the jumping and performance horse. The veterinarian, Dr. Lee Mueller of Mueller Equine Services, visits us on-site providing state-of-the-art equipment, evaluation and vaccine services. The bedding and shaving supplier has been supplying our shavings for well over 30 years. For more information, please contact aurorastables@earthlink.net.